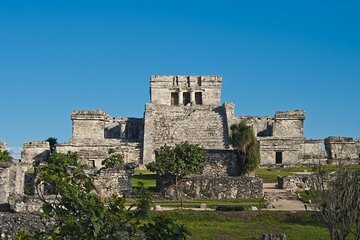 Escape the crowds and explore the mystifying Mayan city of Tulum in relative solitude on this Viator Exclusive full-day tour. Venture to one of Mexico’s most famous Mayan sights in early-morning tranquility and visit areas rarely explored on traditional tours. Admire the rugged coastal setting of Tulum’s ruins while discovering the illustrious history of Mayan civilization from your qualified archeologist guide. 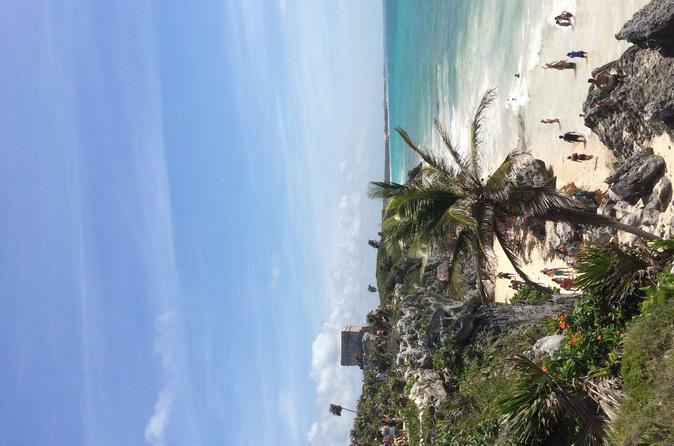 Beat the crush of crowds and gain special insight into Tulum with this Viator Exclusive. As one of the first visitors of the day, you can snap that singular shot of you and your friends in front of the famous ruins — without having hundreds of others muddying the background. Begin your archeological excursion with an early pickup from your Playa del Carmen hotel. Drive south to ancient Tulum, stopping to purchase locally made snacks before continuing the journey to the famous Mayan site. Enter the park as one of the day’s first visitors, enjoying the tranquil atmosphere of the historical fort that overlooks the Caribbean Sea. Imagine the city in prosperous bygone days as your personal archeologist explains how the fort once served as a major Mayan seaport. Be transported to the 13th century as your knowledgeable guide narrates fascinating information discovered on archeological excavations. As you gaze at the atmospheric ruins and dramatic coastline below, visualize a thriving Mayan city in which Central and South American traders bartered with exotic fruit, colorful spices, intricate wooden carvings and powerful obsidian stones. Listen to the waves lap against the sandy shores below and imagine colossal ships sailing towards the fort, busting with tradable goods harvested from the bounteous continent. Admire the enormous stonewall that encloses most of the ancient city center, trying to comprehend its colossal measurements of 1,100 feet long and 500 feet high (335 meters by 152 meters). Wander among ancient temples and perfectly preserved murals before marvelling at one of Tulum’s most prominent landmarks; The Castle (El Castillo) is perched dramatically on the edge of a limestone cliff that towers over the jagged Caribbean coast below. After your fascinating tour, relax with a box lunch during your comfortable return journey to Playa del Carmen. The early start time of this Viator Exclusive tour means you can spend the rest of the day enjoying the warm sun and soft sands of the beach. We could not make contact at any of the numbers provided. We called all 3 numbers provided multiple times the previous day to see where we would be picked up. We waited outside our hotel for 45 minutes and were never picked up. When I returned home I had an email that came the day before our tour. I don't have access to my email from Mexico. In the email they were going to pick us up about 8 blocks from our hotel. This was an amazing tour of the ancient Mayan ruins that date back thousands of years. We went in the early morning to avoid the afternoon heat which was a good idea. It was quite warm, but not intolerable, by the time the tour was over. We learned a lot about the history and the Mayan culture. I think the later tour at that time of the year would have been very hot. Billed as 9 hour tour but actual tour at Tulum was 45 minutes plus some time to look around ourselves. Description said there was a boxed lunch but there wasn't any. Beach was closed that day, which of course they couldn't help. With the driving, was close to 6 hours which is a lot for a 45 minute tour. The tour was supposed to be with and archaeologist but we did not have one. The tour was only 45 minutes of our 2 1/2 hours at Tulum, while the guide was interesting I thought the tour could have been longer and had the guide that was advertised. Don't rely on the box lunch if you are hungry. It consisted of a bag of chips, candy bar and a juice box. Good thing Tulum has a Starbucks and Sub-way. While the site is certainly worthwhile to visit and the historical tour guide did a wonderful job in explaining the archeological and historical background thr tour organizer was under par. First the phone number and e-mail to confirm our hotel pick-up did not work. It took almost an hour and the help from the hotel to get in contact with amigotours in Mexico City. In this process also Viator was not of help because they only provide you with Q and A, but not with a actual person to help. One of their help links did not work as well. Also instead of being picked up at the hotel as advertised one needed to go to a meeting spot. The pick up was 40 minutes late. The tour overbooked hence the use of a minibus for 10 participants and an additional wait of 25 minutes. The advertised lunch was a very small bag of chips, a juice box and a candy. I would call this a snack. Why overselling? The instructions where to meet after the Tulum tour were unclear and we had to search for our bus. Better book local so that you have a person to rely on when needed. The trip overall was as expected, good value for money. The pick-up car was on time. I would suggest few improvements: speed up the communication from the excursion agencies. We booked the trip at lunchtime the day before and had to call them to confirm what time is the pick-up as on the confirmation it said 4am and we knew it won't be that early. The pick-up was not from the hotel but Playacar shopping square. We didn't mind but someone could. I had slight problems to understand the guide who spoke americanized English. We were not happy with this trip. From the start, the schedule was late. Group was too big and the agreed timetables were not respected. We had to wait constantly on the trip. 1. Was impossible to hear the commentary on the coach due to very poor laity PA.
2. Take something to eat as 'lunch' was a small packet of crisps, small chocolate biscuit and a kids drink carton. Extremely disappointed. Tulum itself is very interesting, and our guide was very good, although he did try and sell souvenirs too, which seemed bit strange. All in all OK but a couple of small changes would have made the 2 stars at least 4!